So I wouldn’t call myself an animal lover, by any means. I am not a huge fan of dogs, and cats make me sneeze. However, this spring I felt a bit of a call into having a mini farm in our little country yard. That’s how we came to raise our own backyard chickens! My best friend has grown her own backyard chickens for the past few years now. I admired her ambition and ability to do so. We just weren’t in a place to do much but just live for the last few years. So when spring approached this year and I was starting to plan for children’s spring photo sessions at Drover Photography, I thought, hey lets do baby chick photos. Danielle didn’t have any eggs to hatch for me at the time. But then, through a series of events, I connected with a lifetime friend who owns Humble Farm in Iona, PEI. I gave Leanne my photo shoot date and explained that I’d like some adorable fluffy baby chicks for photos and then I would like to keep about a few of them to raise with our two boys. 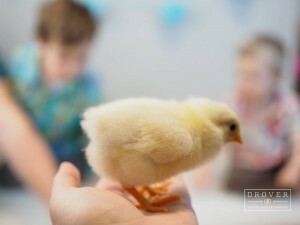 Leanne planned it perfectly and I had 6 gorgeous fluffy baby chicks for the photo shoots (hatched 24-48 hours before!). Since then we have used the raising of these chickens as a wonderful learning opportunity for the boys. They helped feed them when they were still in the porch. 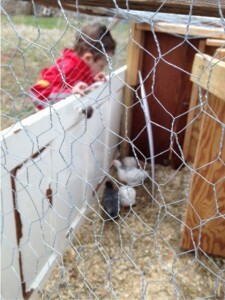 They assisted Daddy in building the chicken coop in our back yard. They are learning responsibility, provision, and long-term vision. Each day they either remind me or assist me in checking on them and giving them fresh water and food. It’s been a lot of fun so far. My husband isn’t overly fond of the idea, but has been very supportive. I promised I’d do the daily care; he just had to build me a coop. And that he did. You might be thinking, why?! Just why bother? Why not just purchase your chicken from a local farmer if you want to ensure healthy homegrown meat? Well, you are in the right place. 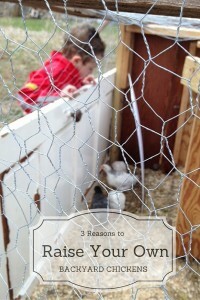 I have three wonderful reasons for you to raise your own backyard chickens. You and your family will learn together about the entire process of a chicken’s life. Throughout raising your own backyard chickens you will be able to show your children the importance of responsibility and being attentive to the needs of other living things. They will learn biology and have a new vocabulary (especially toddlers in this case); along with a lifelong memory and experience that will season them with wisdom to grow strong in this world. 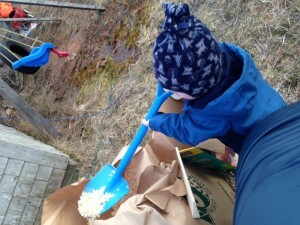 This is our two year old voluntarily shovelling shavings into the newly constructed chicken coop! You get to be frugal and save some money on your grocery bill! Once you get a small coop setup its relatively inexpensive to maintain your own backyard chickens. Our chicken coop cost less than $25 to make and could easily house 10+ chickens. A giant bag of feed is inexpensive; and chickens love some table scraps (be sure to do your research to make sure you are feeding your chickens appropriately). We have given our chickens oats, scraps of breads and crackers, along with some fruit and veggie peels. Your health matters! Its super easy to putter along in life and forget that you aren’t actually in control of your food choices. We all know so many of our foods are chemically induced. Here is one simple and fun way to be conscious about what you are putting in your bodies. Every little thing makes a difference, no matter how small. Plus, its fun. Are you ready to raise your own backyard chickens? I’d love to hear from you!